KVPY 2018 Registration Payment last date was 7th September 2018. Indian Institute of Science (IISC), Bangalore conducts a national level scholarship programme. This exam is known by Kishore Vaigyanik Protsahan Yojana (KVPY). KVPY Exam is organized for providing generous fellowship & contingency grant to the selected KVPY fellows up to the pre-Ph.D level or 5 years. This programme is started by the Department of Science and Technology (DST), Government of India. Check this article to get complete details about KVPY Application Form 2018. KVPY 2018 Application Form last date was 31st August 2018. Fee payment last date was 7th September 2018 only for registered candidates. Click here to fill application form. KVPY 2018 Registration had been started from 11th July 2018. Last date to fill the application form was 31st August 2018. There is no other mode to get the KVPY Application Form 2018. Before filling the application, candidates keep ready with the scanned images (photograph, signature & scanned copy of caste/medical certificate (only for PwD). Fill the application form carefully and submit it. Take a printout of the KVPY 2018 application form for future references. Candidates have to pay Rs. 1000 (for general/OBC category) & Rs. 500 (for SC/ST/PwD category) as a registration fee. The fee can be deposited through two modes, i.e. online mode (credit card/ debit card/ internet banking) and offline mode (Challan). Nationality: Applying candidates must be an Indian Nationals. For Stream SA: Candidates, those studying in 11th standard with science subjects & secured 75% aggregate marks (65% marks for reserved categories) in Mathematics & science subjects in Class 10th can apply. For Stream SX: Candidates who studying in class 12th & score 75% marks (65% marks in case of SC/ST/PwD category) in aggregate in Mathematics & science in 10th standard can also apply. For Stream SB: Candidates, those studying in 1st year of UG course in basic sciences & score at least 60% marks (50% for reserved categories) are also eligible. KVPY registration 2019 will be started from the month of July 2019. Kishore Viagyanik Protsahan Yojna is a national level fellowship programme regulated by the IISc. 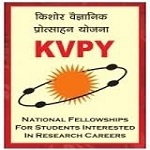 It is conducted to provide fellowship up to the pre-Ph.D. level to the selected KVPY Fellows. Navigate to the official website link (Link is given above). Now, click on the link “Login for Application”. After that, you have to fill your name, DOB, email id, mobile number, studying class, select stream, nationality & specify citizenship. You will receive an sms/email regarding the “User ID” & “Password” on your registered Email ID or Mobile No. Login with the “User ID” & “Password”. Now, you have to fill your personal, qualification and exam city preference. You also have to upload scanned photograph, signature and other certificates as applicable. The size of the photograph & signature should not be more than 80KB in JPEG/JPG format. The caste certificate size must be 300KB in JPEG/JPG/PDF format. Now, you have to select the payment mode and pay the application fee through online/offline mode. After two days, candidates can check their application status & take the printout of the application form. Question: How will I get the application form? Answer: The application form has been issued through online mode only. No offline application is available. Question: When will the KVPY 2018 Registration start? Answer: The registration has been started from 11th July 2018. Question: What should I do if the required scanned document size will exceed? Answer: You have to compress the file & then upload it. Question: I am studying in 11th class from science group. Am I eligible to apply? Answer: Yes, you are eligible to apply for stream SA. Question: What is the last date to apply for the exam? Question: Can I pay the fee through offline mode? Answer: Yes. In offline mode, you have to download the Challan & submit the fee. Question: After the form submission online, is there any need to submit the application by post? For any other query about KVPY Registration 2018, you can leave your queries below in the comment box. Link is given in our article. If i’m then what will be the syllabus. Will questions come from 12th class syllabus. I’m currently studying in 12th standard (PCM).Am i eligible ? I’m studying class 12th at present now which sream should i apply. Link is not activated yet. Igot CGPA 9 in 10th.can I give the exam. what is the link? where I would get the registration form? I am studying in 11th std. my 10th maths mark is 72 out of 100.
can i apply for this exam? Is it compulsory for SA stream for done paper of PCMB? Yes, can give the exam. Will I be informed about when the registration is starting ? I am studying in 11th science stream and I have got 98% in maths and 87% in science.So I got 92.5%in aggregate.Can I apply for KVPY? I am in 12th standard. Can I apply forSA stream? You can apply is Sx stream. How to pay the exam fee? Can we pay it by offline mode? hi i m in class 11th and having physics, chemistry and biology. do i am eligible for kvyp? I have passed +2 this year with 83%. Am I eligible for this Test. If yes then….. under which stream should I apply?? You can apply under SX stream. Eligibility is given in our article. Sir I have passed class 12th standard exam with 81.4% marks in 2018.I was a student of science stream.Am I eligible for KVPY exam 2018? Please tell me that I am class 12 passed students in this year. Then I give kvpy exam and which stream I take. I have just passes 10th class with 97 marks in maths and 83 in science, can I apply for kvpy? Sir I scored 10 points as CGPA in my 10th. In 11th I scored 90 in science and 73 in maths .Am I eligible for writing this exam? I am in BTECH first year(academic year 2017-2018 and i have completed my first year , my 2nd semester result has been declared on 31st of may and i have secured 8.32 SGPA in second semester . I want to ask that am i eligible for the exam of KVPY 2018. What will be cut off marks for OBC category for applying after icse 10th std. in 2018? My daughter is in 10th now….Is there any KVPY exam she could attend? Sir I study in the 11th standard pursuing the commerce stream. Am I eligible to appear for the examination? You can apply now also. Sir i am a student who appeared the 12 board exam in this year(2018). Am i eligible for KVPY 2018 scholarship?? Sir i have taken board examination for 2017-18 a month before. For session 2018-19 of kvpy which stream should i take sb/sx? I am student of class 12. I have secured 86% in 11 class in PCM. Am I illegible for KVPY.how can I apply it? Yes, eligible. Application form is not released yet. Sir, i got 8 grade in mathematics and 9 grade in science subject in class 10th.should i eligible for the kvpy exam and i am belonging to general category. Can to apply kvpy my max in 51%in 12th (maths) group . Give the details of payment:beneficiary name,a/C No.bank details for Rtgs. what hell it is , i couldnot find any site for registration. I have already completed my 12th class but I am presently doing a long term. Am I eligible for kvpy 2018 sx stream..
read the streams and you will be known. My daughter will be completing her 10th in 2018. Is there any exam under KVPY after 10th or for which stream can she apply? For KVPY 2017 exam, a 11th student is eligible to apply? I did amistake in application form how can i correct it.is there any correction option.